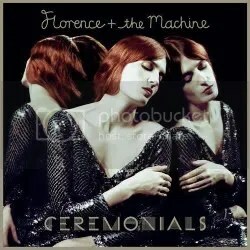 Ceremonials by Florence & The Machine is the follow-up to her first album Lungs, and The mood of Florence Welch’s second album is set by the cover, on which she appears to be posing for a pre-Raphaelite artist.The mood of the disc inside, too, is also decidedly pre-Raphaelite: a gothic fever dream of romance, striving for intensity. Ceremonials always sounds wonderful – producer Paul Epworth has created a warm, sumptuous sound which is complimented by Welch’s powerful and emotive voice. This contrasts with Florence Welch’s previous album Lungs, which was written in the wake of a failed relationship, and reached number 1 in the album chart helped by some great singles like “Dog Days Are Over”, the lovesick anthem “Drumming Song” and the Candi Staton cover, “You’ve Got the Love”. The album also helped Welch gain a diverse roster of fans including fashion designer Karl Lagerfield. But Whereas The last album sounded heady, wounded, raw and almost desperate at times. the second album is definitely more settled. Florence recently said of her second album That “It feels more joyous, but I wouldn’t say happily-ever-after. It’s not completely a case of ‘Everything’s fine, now!’ because everything’s still… Even if you’re in a relationship things are complicated. There’s probably lots of things to deal with.” this more settled sound is due in part to her being back with her chap. the villain of Lungs, with whom ahe patched things up not long after that album was released. She also said Recently that she would love to appear on family science-fiction drama “Doctor Who”, after having really got into the programme and become a “total geek” for the show since Matt Smith took over the role of The Doctor. I reckon that given the gothic feel to some of her promo videos she could add a really gothic, spooky and creepy atmosphere to the program which would be perfect and would soon have people hiding behind the sofa.